Despite the Chinese stock market’s recent downturn, China remains a highly attractive market for foreign companies and one of the world’s major centres of wealth creation. In addition, this second-largest economy on the planet is expected to grow by 950 billion USD in 2015, according to the International Monetary Fund. For some years now, the Chinese economy has been undergoing a transformation and providing a number of business opportunities. China is becoming richer, more urbanized, and increasingly oriented towards a knowledge economy. To seize opportunities, one must have a good understanding of this transition and be able to anticipate future needs. Chinese companies are becoming increasingly influential on a global scale. They are growing, they invest in research, and some 100 of them are on Forbes’ list of the 500 largest global fortunes. The Chinese have understood how important innovation is to remaining competitive, and they have stepped up efforts to promote education and protect intellectual property. Board of Trade member companies that have made the leap! The business community had been hoping for a direct air link with China for several years. 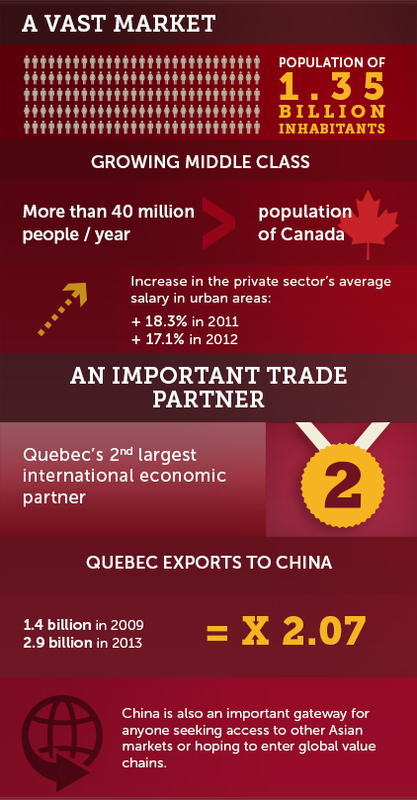 While it is now Quebec’s 2nd largest trade partner after the United States, China only receives 3.9% of Quebec’s exports. This is far from bad news, but it shows that there is incredible growth potential for businesses seeking to develop this market. China has undergone an economic transition that will be the source of numerous business opportunities, and Montréal companies are today better equipped to take advantage of them. Aéroports de Montréal is delighted with Air China’s decision to begin making direct flights between Beijing and Montréal, starting on September 29, through a partnership with Air Canada. This long-awaited decision is the culmination of many years of effort to interest an airline in serving this strategic market. We are convinced that the Montréal community—and the business community in particular—will clearly demonstrate its enthusiasm for this air route. I look forward to seeing you at Montréal-Trudeau for the inaugural flight scheduled in September!